Denny Hamlin and the #11 FedEx Racing team posted its best finish of the season with a seventh-place result in the most recent race at Las Vegas Motor Speedway (March 6). A pre-race engine change negated a 17th-place starting position and moved Hamlin to the rear of the field for the green flag, and the team was never able to capitalize on strategy to improve track position. Picking off positions during long green flag runs and tidy work on pit road helped the #11 Toyota move up in the running order during the 267-lap event won by Carl Edwards. The finish moved Hamlin up six spots — from 14th to eighth — in the NASCAR Sprint Cup Series point standings after three of 36 races, as the team heads east following an off-weekend for a 500-lap race at Bristol (Tenn.) Motor Speedway. Hamlin is 18 points behind leader Tony Stewart. Hamlin is making his 11th career Cup Series start at Bristol this weekend in the #11 FedEx Express Toyota Camry, looking for that elusive first win on the half-mile, high-banked ‘bullring.’ The 30-year-old has three top-five finishes and five top-10 results in 10 previous trips to the track, including a second-place run in the spring 2009 event. 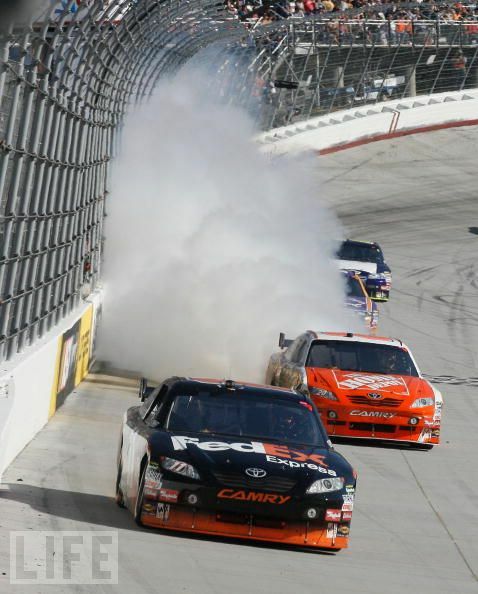 Bad luck has bitten the #11 FedEx team a couple times in previous spring races at Bristol. In 2007, Hamlin led 177 of 504 laps before fuel pickup issues 20 laps from the finish caused intermittent power and a 14th-place result. One year later, Hamlin led 98 laps — including at the start of a ‘green-white-checkered’ overtime finish — when pickup issues arose again and yielded a sixth-place finish. Hamlin finished 19th in the spring 2010 event at Bristol after an early cut tire and contact with the wall caused damage to the #11 machine. A broken drive shaft in the most recent race at Bristol last August relegated the team to a 34th-place finish, 27 laps off the pace after extensive time in the garage for repairs. In total, Hamlin has led 282 laps at Bristol, with an average finish of 14.6. The Minneapolis/St. Paul markets “MSP” letters will be on the b-post of the #11 FedEx Express Camry this weekend at Bristol, in recognition of the operation teams performance. The team has earned increased productivity the last three quarters and had zero market-caused delays for the most recent quarter. How special is it to have the race named after former track president Jeff Byrd? How has the progressive banking changed the racing at Bristol? As a basketball fan, who do you think will win the NCAA tournament?